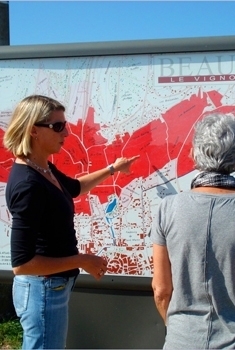 Kim Gagné founded Journeys in Wine in 1999, shepherding small groups of wine enthusiasts through the wine regions of France, sharing with her clients a wealth of experience and knowledge as well as a passion for wine and its rich heritage. It was her work in the California wine trade in the late 1980’s that enticed Kim to travel to France to learn its language and wines. A year’s immersion in Burgundy ended up as an extended stay of 10 years. During that time, she ran a luxury biking and hiking tour company and exported wines to the United States. And, she created Journeys in Wine, a culmination of her life and work. Consider a tour with Journeys in Wine as a passport to some of the world’s exceptional wine regions. No need for a guidebook, our itineraries are customized to your pace and interests -- wine, cuisine, biking, hiking, history or simply exploring the picturesque countryside. Travel with us to get an insider’s view of the not-to-be-forgotten wine regions of France, California and Oregon.